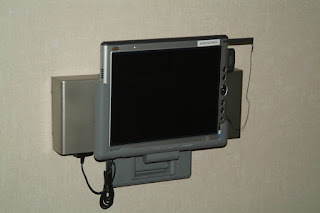 I was visiting someone in the hospital this Thanksgiving week and I couldn't help notice the huge number of Motion Tablet PC's in use in the hospital. Staff were using them as mobile workstations running Cerner software. 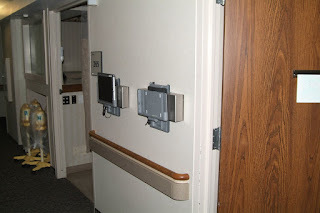 In the photo above you'll notice that they even have the hardwired charging easels mounted on the wall so nurses and doctors can just grab one and go when making rounds. Just slide them one out of its easel and it goes from being hardwired to the network to automatically connecting to the secure wireless LAN.